Every place I am acquainted with is buzzing with excitement because of Luca Guadagnino’s adaptation of the book. It was initially released last January 22 of this year. I have not seen the movie, though. I don’t usually watch book adaptations (with only two exceptions: the Harry Potter series and Game of Thrones series). Although, Guadagnino’s peculiarity on shooting the entire movie with a 35 mm lens alone, and his reason for doing so, are really intriguing. So, you may rest assured that this is not a movie promotional review. CALL ME BY YOUR NAME was our TFG book for March of 2016, and it was on my best book list, too. Exploring the internet, you’ll see both accolades and rebukes for the author, the same goes with the book. The aptest description I’ve read so far was “maddening”. This book has the capacity to hurl my emotions into a turbulent sea. My need to resurface for air, every now and then, was acutely palpable. Reading Elio prompted me to look around me, asking myself if I made the right choices. Mindfully, he allowed me to view choices akin to a tub of boiling water, jumping in will not spare me from scars, but it will be absolutely liberating. I will wear those scars proudly because they are intrinsically part of me. Elio made choices by predicting how these choices will affect his feelings, his being, in the future. He, in every sense, provides his future adult self an emotional revelation he befittingly deserves. It astounded me (it still does, I believe) how Elio marries his present and his envisioned self without any sense of insincerity or regret. 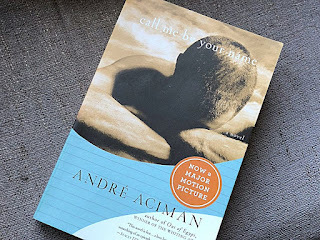 As much as people categorized this book as an LGBT novel or romance, it will remain as a coming of age book for me. The greatest magic of this book is that it shows people, and I mean everyone, will transform. This space we occupy now, though necessary, is evanescent. We will, in essence, continue laboring for our envisioned future selves. In his purity, Elio created a portrait of a love fated to last lifetimes, even when that love is no longer with him. Since every human is driven by desire, we choose to love someone that will aid us to project the kind of person we want to be, into a full-bodied being the world will see. Every desire, present or absent, will help ferry us into that envisioned being. SPOILER ALERT. The best part of this book for me was the father and son reserved scene. It bespoke of a father’s unparalleled love for his son. It squeezed my heart, because, truly, in our pursuit of that envisioned self, we will need all the people who love us.